President Obama announced moments ago Chrysler will officially file for a "quick" Chapter 11 bankruptcy protection under United States Code in New York bankruptcy court later today, then partner with Fiat. Here's what happens next. 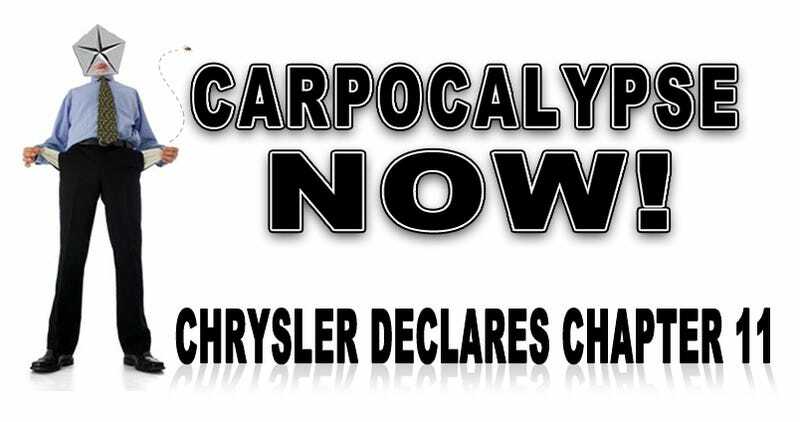 After months of hanging by a federal loan lifeline, Chrysler will officially file for bankruptcy protection today. As many are aware, bankruptcy in the United States is permitted by the United States Constitution (Article 1, Section 8, Clause 4) which authorizes Congress to enact "uniform Laws on the subject of Bankruptcies throughout the United States." Congress has exercised this authority several times since 1801, most recently by adopting the Bankruptcy Reform Act of 1978, codified in Title 11 of the United States Code, commonly referred to as the Bankruptcy Code. What the federal government is hoping for — in it's happiest-of-happy-thoughts scenarios — is a quick "surgical" bankruptcy of only 30-60 days with Fiat swooping in to pick up the pieces of a tarnished and broken Chrysler, helping them to right the company with an injection of $3.5 billion in DIP (Debtor-In-Possession) financing — a special form of financing provided for companies in financial distress or under Chapter 11 bankruptcy process that allows the company to operate as it sheds contracts. Then the Feds will give $4 billion in "exit financing." First to go will be legions of dealer contracts that will be shed like so much dead skin off a snake. The UAW has already agreed to certain cuts in their 1997 contract that should take care of their needs. That relatively rosy scenario can be broken up at any time if one of thekey stakeholders — a few bondholders for instance or one of the major Tier One suppliers — decide to stall the process out of a desire to get a better deal than the one being pushed by President Obama's auto task force and Treasury Dept. However, despite President Obama not "standing with these minority stakeholders," under the federal bankruptcy code, companies need only a majority of a creditor class - defined as two-thirds of the dollar amount of that class of debt, and more than 50 percent of the holders of that class - to agree to a reorganization's terms to foist that plan upon holdouts. That standard is lower than the almost complete acceptance usually required for an out-of-court debt restructuring to succeed. Additionally, Chrysler Financial will no longer be offering lending for Chrysler vehicle purchases. Instead, GMAC (owned by Cerberus, Chrysler's master-for-the-moment) will step in to the breach. So what happens next? Well, we're just going to have to wait and see.